Despite the best haircare, hair is still very difficult to style into unusual shapes with normal styling. 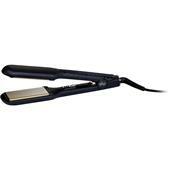 Certain styles generally need more hold than healthy hair structure can offer. The problem is therefore not with the haircare or the hair structure in general but with the physical and biochemical base structure of healthy hair with regards to unusual styling wishes. 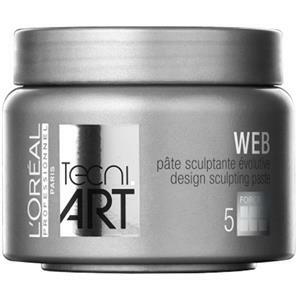 The Web Structure Paste – Tecni.Art from L’Oréal Professionnel was developed for this reason in order to give hair the necessary properties. 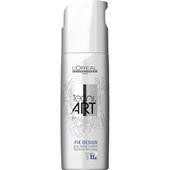 The Web Structure Paste – Tecni.Art from L’Oréal Professionnel immediately gives the hair the necessary structure so that you can use certain physical laws and biochemical effects to form the styles – or can cleverly bypass these. 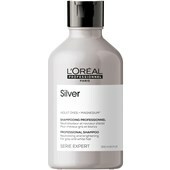 The Structure Paste is suitable for all hair types. 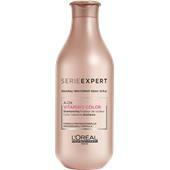 It causes strong fibre formation and therefore allows almost limitless restyling for a textured and structured look. 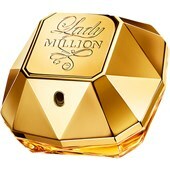 A very strong hold is created for the style which also offers you sufficient security even when moving quickly. This is particularly beneficial for dancers and athletes. Through the very strong holding effect on the hair you can also make styles that would otherwise be impossible due to the effects of gravity. You can also create the impression of significantly more fullness with a thin hair structure by forming the structure so that more volume is created visually. 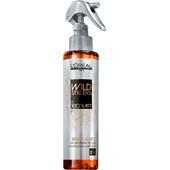 The Structure Paste offers you a lot of creative scope when styling. Be experimental and explore the possibilities. If you use the Structure Paste after normal haircare then you will obtain an additional silky shine that doesn’t look artificial but very natural.